FELPAB, Davis Warriors, Shield, and Return of the King hold video conference with UC Davis WIFSS personnel to report on their LTC projects. It was a war on plastics that earned Return of the King the championship medals of the 2018 Lunchtime Challenge. Return of the King was one of four teams competing in the 2018 Lunchtime Challenge. 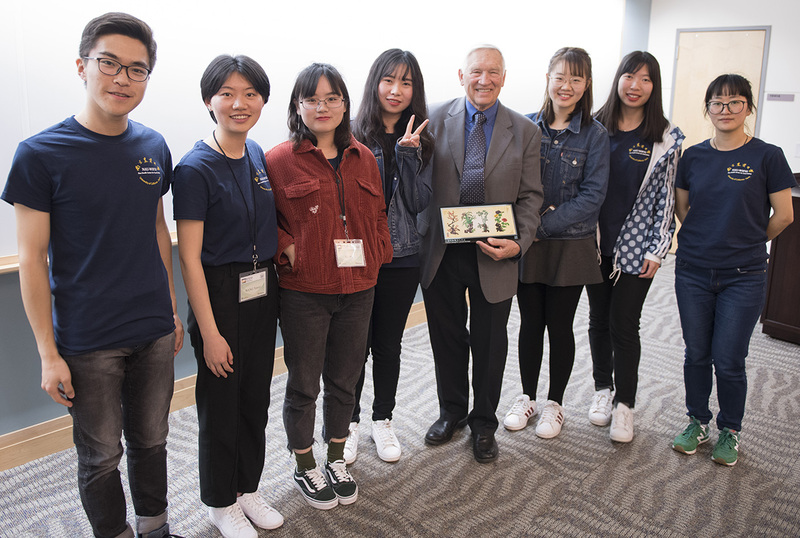 Their team included seven undergraduate students from Nanjing Agricultural University, (NAU), who attended the NAU-UC Davis Education Conference on One Health for Food Safety and Security held at UC Davis, January 22 – February 9, 2018. The Lunchtime Challenge competition took root following the 2017 winter conference when students returned to Nanjing wanting to find a way to continue working together to solve food safety, public and environmental health problems. They established the Lunchtime Challenge and dedicated themselves to spend 16 lunch periods, spanning two months, to develop well-planned strategies for collecting relevant information through surveys, seeking solutions to identify problems, and defining a means of informing the public of the issues. Their immersion into a 3-week conference on integrating One Health for food safety, public and environmental health, with team building experiences and a call to action, fortified their desire to keep working together on their projects. The conference brings together students from studies as diverse as life science and technology, to plant protection, veterinary medicine, food quality and safety, ecology, and agriculture resources and environment. By the conclusion of the conference friendships are forged through attending lectures and field trips together, and participating in team-building exercises such as the Good Guys vs. Bad Bugs competition. The energetic and competitive exercise teaches them the importance of taking a multidisciplinary approach to solving complex problems concerning the health of people, animals and the environment. During the 2018 winter conference the students christened their teams: Shield, Return of the King, Davis Warriors, and FELPAB. FELPAB stands for food, environment-ecosystem, life sciences, plant protection, agriculture/animal science, and biology. 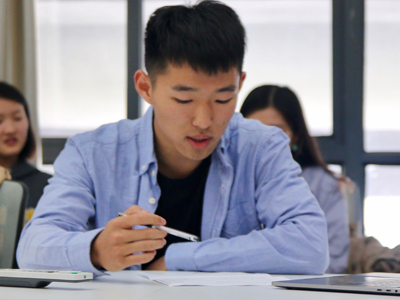 Linzhen Hu, from FELPAB, considers options for the team project during a 2018 Lunchtime Challenge session. On April 24, 2018, during a video conference with WIFSS personnel, teams FELPAB, Return of the King, Shield, and the Davis Warriors, reported about their individual projects. FELPAB focused their project on methods of reducing pesticide residues on raw fruit. Shield conducted a study of how medical waste on campus is disposed of and student’s acceptance of health services in the campus environment. The Davis Warriors were looking for different chemical indicators that could be used to identify unsafe foods. Return of the King raised attention to plastic waste and developing a habit to classify waste into separate containers. They conducted interviews, promoted dialogue on WeChat, wrote a letter to the mayor, passed out questionnaires, gave a lecture, and hosted an exhibition. They went above and beyond the 16 lunchtime meetings. Hundreds of people attended a campus lecture where Return of the King discussed the harmfulness of plastic waste and the significance of waste classification. They encouraged audience participation in ideas for taking action. Photos taken at the lecture were posted on WeChat which stimulated further dialogue about the problem. 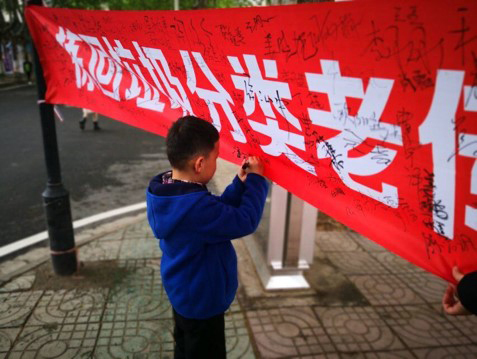 A young boy signs the banner to show his commitment to recycle. People were encouraged to bring plastic waste to the Exhibition in exchange for a postcard or bookmark showcasing the team during their time at UC Davis. Exhibition goers who brought 30 plastic bottles or more to the event were rewarded with a green plant. Taking it one step further, the team stuck signs on waste receptacles reminding people to sort their garbage. Here Tony is placing stickers on waste receptacles that help explain what garbage should be placed in which bin. Through interviews Return of the King discovered that students have a desire to recycle but they are confused about how to separate waste since often it’s not clearly posted on containers. The team wrote a letter to the mayor of Nanjing introducing themselves and describing the success of the Exhibition. The team is encouraged to see a rising awareness of the importance of recycling. They shared their fellow student’s enthusiasm for recycling, and noted, the confusion over the identification of proper classification. The team is concerned about the harmful effects of plastic on the health of people, animals, and the environment. However, they are confident that the cooperative efforts of all fields of society can bring about an environmental balance. The Lunchtime Challenge has blossomed into a thriving student-driven annual event. It’s growing in popularity, from the 15 students onboard for the 2017 LTC to 40 students in 2018. As they become aware of important issues facing the health of our planet they mobilize teams consisting of individuals from different backgrounds all of which contribute to defining the problem, followed with a call to action. This model of teamwork will serve them throughout their educational endeavors and beyond as they chart a course for the foundation of future programs addressing the health of people, animals and the environment in which we all live!